I used IE for a long time. It was/is awful. So I moved to FireFox 3.0 which I loved thorugh ver. 28. The Australis caused me to move to Pale Moon. Now this is becoming not so good either. So I am looking around for a new browser. I currently use Windows 7 and plan to move to Linux between now and 2020. I will never use windows 10, IE, Edge, Chrome or Firefox unless they get major redesigns. 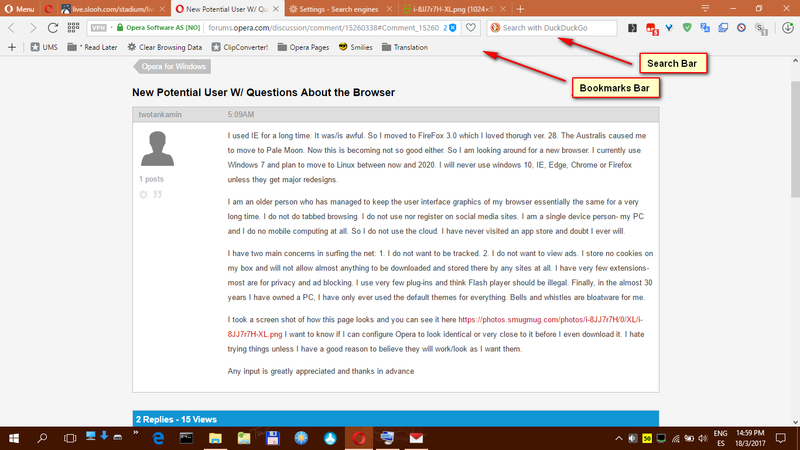 I am an older person who has managed to keep the user interface graphics of my browser essentially the same for a very long time. I do not do tabbed browsing. I do not use nor register on social media sites. I am a single device person- my PC and I do no mobile computing at all. So I do not use the cloud. I have never visited an app store and doubt I ever will. I have two main concerns in surfing the net: 1. I do not want to be tracked. 2. I do not want to view ads. I store no cookies on my box and will not allow almost anything to be downloaded and stored there by any sites at all. I have very few extensions- most are for privacy and ad blocking. I use very few plug-ins and think Flash player should be illegal. Finally, in the almost 30 years I have owned a PC, I have only ever used the default themes for everything. Bells and whistles are bloatware for me. I took a screen shot of how this page looks and you can see it here https://photos.smugmug.com/photos/i-8JJ7r7H/0/XL/i-8JJ7r7H-XL.png I want to know if I can configure Opera to look identical or very close to it before I even download it. I hate trying things unless I have a good reason to believe they will work/look as I want them. 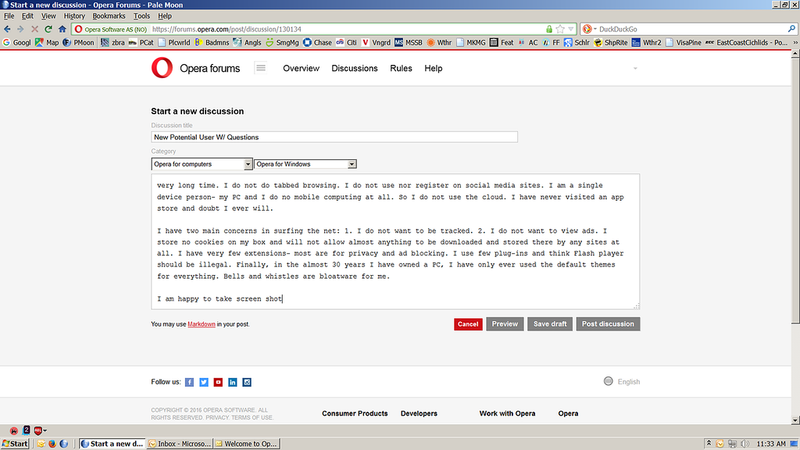 Opera prior to 15 could have looked like that - current versions do not have a menu bar even as an option. I want to know if I can configure Opera to look identical or very close to it before I even download it. I don't think so. Current version of Opera has a different design, something more 21st century. Without bar extensions on the bottom, just next to the address bar / search and some on the left side. TY all for the info. You have saved me a lot of wasted time had I downloaded the browser. I left FireFox because 21st century basically means tiny screens and lack of choice. I cannot not use tiny screens. Looking at the screen shot above, I have no clue how I could use something like that. Most of the icons have no meaning for me. I also am ingrained to read from left to right and want almost nothing on the right side of the screen in terms of controls, especially the more important ones. Please do not take this as a reflection on Opera but as a reflection of what works for me. Well, the icons are the extensions I use :lol: but they will be there if u install any from Opera Addons or Chrome Store.